﻿ Ooku « Haikasoru: Space Opera. Dark Fantasy. Hard Science. We were thrilled last week when Ôoku vols. 1 and 2 won the Tiptree award. I asked editor Pancha Diaz to share a few words with the Haikasorunauts. She even gives away a few tidbits about future volumes, so do check it out. By the way, the third volume of the series will be available next month! Ôoku just won the James Tiptree Jr. Award, and this is exciting for me on a number of levels. It’s always wonderful when a title I work on is nominated for an award, and even more so when it actually wins. That Ooku was the first comic awarded this prize, and that this prize recognizes the exploration of how we understand gender through literature makes me gleam with joy and pride. I am incredibly proud to be a part of the team that brings this excellent story to an English readership, and of the hard work Akemi Wegmüller does in translating Fumi Yoshinaga’s exceptional work. For the curious, we use a variation on Elizabethan English because we feel it is the best way to convey the archaic Japanese Yoshinaga uses in the original. The premise of Ôoku is simple: three-fourths of the men in Edo Japan are wiped out by a mysterious plague, and when it becomes clear that the disease is not burning itself out anytime soon, the women have to step into all the roles previously assigned to men. Including that of shogun. When we are first introduced to this world in volume, the Redface Pox has been around for over eighty years. Many people no longer remember a Japan plentiful with men. At first glance, it seems a rather straightforward reversal of gender roles. But Yoshinaga takes it further than that. While men are no longer in positions of authoritative power, their scarcity makes them “precious bearers of seed.” Even the lowest ranking of men are coddled and given the best food of the household, even if this means mothers and sisters are starved. Yet at the same time, men are prostituted out by their own families, to friends, neighbors and strangers. Only wealthy women can afford to buy husbands, and he provides an easy way to augment their coffers and recoup the groom price. Women also take over the trades once performed by men—farming, fishing, carting, etc—and yet still do the traditional women’s work. The men don’t take over the household duties or childcare when they are banished from the fields out of fear for their health. Essentially, the only role given to men is reproductive. And while in our own world women’s roles have been defined by their reproductive potential, they are not totally limited by it. The men of Ôoku, especially those in the shogun’s Inner Chambers, have been cast adrift. They are necessary only because humans reproduce sexually. In all other ways, this new Edo society has done away with the need for men. I’ve been able to read up to volume five, so without spoiling anything, I will say that this reducing of men is being felt more keenly in each volume. Since most women in the world of Ôoku don’t interact much with men, masculine stereotypes are shifting. All the good qualities once ascribed to men have been granted to women (along with all their jobs), while all the bad male qualities have been heightened. The male characters readers are introduced to are frustrated with their lot in life, but lack the vocabulary to explain why. For them, this is how life has always been, and always will be. 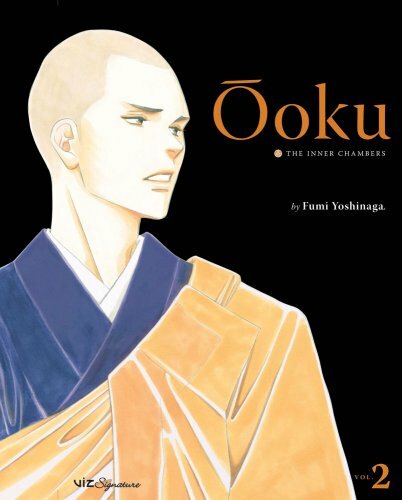 I can’t predict where Yoshinaga will next take Ooku (which is one of the reasons I enjoy the series so much) but I eagerly await each new volume and the deft unfolding of this tale. I’m off to the International Conference on the Fantastic in the Arts in just a few minutes, but I needed to log on to congratulate the folks at VIZ for the selection of Ooku Volume 1 and Volume 2. as a winner of this year’s James Tiptree Jr. award. Posted in Science Fiction | Comments Off on Tiptree!